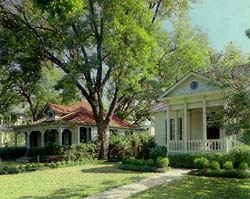 The King William Historic District is an elegant neighborhood built on land once farmed by Mission Concepción. Settled by German immigrants, the district represents their achievements as they prospered and built opulent homes and mansions. Among the homes, several are notable for their architectural style. They include the Ike West House, a 2-story Victorian with curved porches and iron crestings on the roof; the Wulfe House, a pink stucco residence built in 1873; and the Sartor House, an outstanding example of a typical San Antonio Victorian. Three of the best examples of mansions within the district are the Polk Mansion, built in the Renaissance style; the Groos House, a Victorian mansion with an unusual cupola; and the Steves Homestead, built in 1880 and modeled after a French Renaissance mansion. 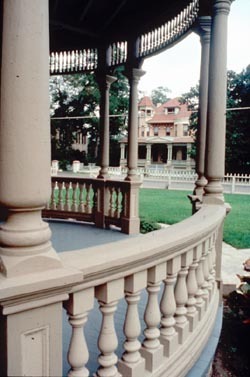 One of the only houses within the district not built by German immigrants is the Oge House, a Greek Revival residence built in 1860 by the U.S. Army as the commanding officer's quarters for the San Antonio Arsenal. The King William Historic District encompasses 25 blocks and is roughly bounded by Cesar Chavez Blvd (formerly Durango), Alamo and Guenther sts. and the San Antonio River in San Antonio. For further information, call 210-227-8786 (King William Association) or visit San Antonio's Conventions and Visitors' Bureau's website. Several of the historic sites in the district have also been documented by the Historic American Buildings Survey.